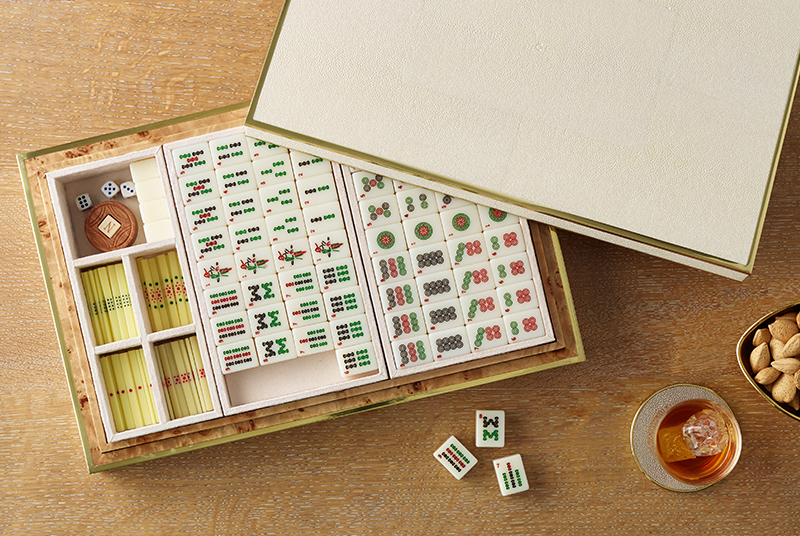 I have always appreciated the beauty of Mahjong, particularly the tiles engraved with vibrant characters and symbols. Presented in a luxurious cream shagreen box with brass hardware, it is a perfect addition to the AERIN games collection. Mahjong originated in China in the mid to late 1800s, and spread to other countries from the 1920s onwards, including the United States, Great Britain, Japan, and Australia, where variations of the original game developed. It is no surprise that there has been a Mahjong renaissance in recent years; it’s an ideal after-dinner game for up to four players, while the co-operation required to play makes it a great choice for families. While researching the game, I found that it is much easier to play than its appearance suggests (similar to the card game, rummy). I also discovered Mahjong means “sparrows,” and a ritual before you begin is shuffling the tiles, known as “the twittering of the sparrows.” I think it’s a lovely detail. The AERIN games collection includes backgammon, tic tac toe, chess, and dominos, all presented in shagreen and brass boxes that look beautiful on a shelf or tabletop. The collection also includes a Shagreen Card Case.